In 1909, the Lincoln Cent began production. Designed by Victor D. Brenner, the Lincoln Cent was the first United States circulating coin to bear the image of a real person. The public loved the coin, but was less enthused about the designer’s initials, V.D.B., appearing conspicuously at the bottom of the reverse. The Mint quickly acted to remove the V.D.B, but not before a microscopic mintage of 484,000 was released. The initials were restored in 1918 on the front Lincoln’s shoulder, in much smaller letters, where they remain today. Over the years, many collectors have gotten their start in the hobby with Lincoln Cents. One of the first things to learn is that the 1909-S VDB is the toughest date to find, and thus carries the biggest price tag. Even a barely recognizable, authentic example sells for at least $500. Prices rise quickly after that. Small wonder, when you think about how many collectors are competing for such a small, finite supply. The 1909-S VDB has been "King of the Mountain" among Lincoln Cents for as long as anyone alive today can remember, and quite valuable. This was not always the case. In Walter Breen's Complete Encyclopedia of U.S. and Colonial Coins , he documents that one dealer, John Zug, purchased 25,000 of them directly from the San Francisco Mint. A few years later, Zug was selling them for 1.75 cents each. Hard to believe, but the best examples of the 1909-S VDB today can sell for as much as $50,000 to $100,000. It's highly probable some of these top sellers came from Zug's stash that were once sold for less than two cents! 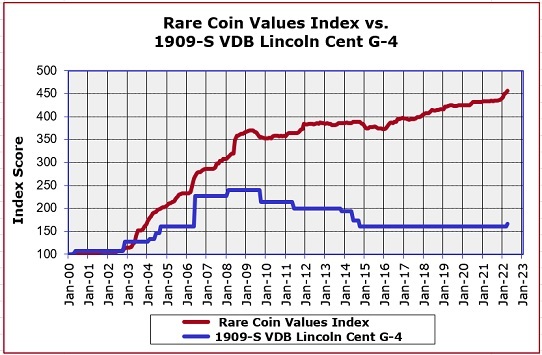 The blue line above depicts the percent change since the year 2000 in retail price of the 1909-S VDB Lincoln Cent in G-4 condtion. The red line illustrates the general direction of the rare US coin market during the same time period, as determined by the Rare Coin Values Index. Both start at a baseline rating of 100 in year 2000. Because of strong collector demand, the 1909-S VDB has consistently gained in value, but still rates below the composite score of the Rare Coin Values Index. The 1909-S VDB is only one of 87 rare coins tracked in the Index, which is updated monthly.